FRESNO – Noyan/Frazier Properties has announced a contract with Vallarta Supermarkets to open a third location in Fresno at the southwest corner of Clinton and Weber Avenues in the planned Mid State Shopping Center. The new supermarket is scheduled to open by the end of 2015 and will recruit over 200 employees as well as generate more than 100 construction jobs. Centrally located, the Mid State Shopping Center is an ideal location for a Vallarta Supermarket serving customers on both sides of Highway 99. Vallarta’s confidence in Fresno is demonstrated in its commitment to serve as the anchor tenant of a brand-new shopping center and investing in the new construction of a building rather than renovating a previously occupied space. 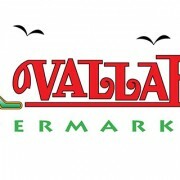 Vallarta Supermarkets offer a wide variety of Latin foods and products which can only be found at its stores including meat cut to order Latin style, spices, hot foods ready to eat, sweet breads made daily, and fresh produce in addition to other products carried at traditional grocery stores. The future Mid State Shopping Center will stand at approximately 85,000 square feet with Vallarta Supermarket occupying 45,000 square feet. Commercial shops will be phased in to complete the balance of the center.